Royal Enfield motorcycles are the most popular choice of enthusiasts and modifiers when it comes to cruiser or bobber themed modification. This is because of many reasons like its heavy duty frame which is suitable for custom modification and the low-end power rich engine. The loud exhaust note is another factor that makes them the most preferred choice. The cost for these mod jobs can range from a few thousand bucks up to lakhs of rupees. However, this video below showcases a modified Royal Enfield that costs about 13.5 lakhs. That’s quite a sum for a Royal Enfield modification. 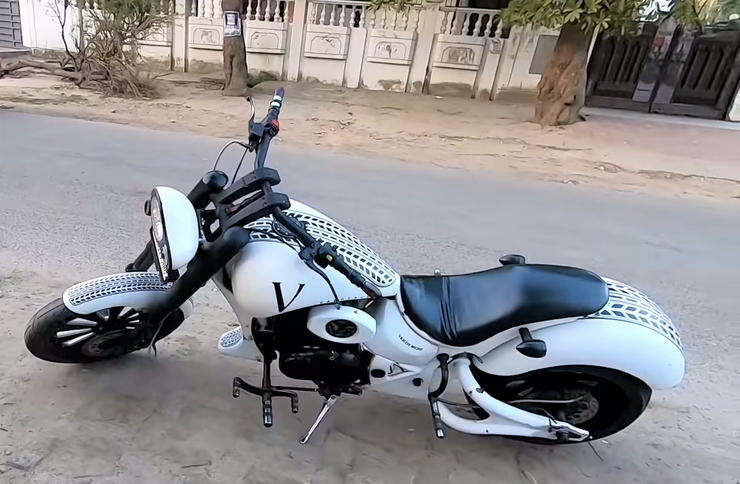 Check out the video by Ayush Verma to see the bike in motion. Now there is no limit as to how much one can invest on a bike. Modifications worth more than Rs. 20 lakhs are also possible on a Royal Enfield but the question is would it all be worth it, or is it better to buy a sports bike in the same money. We’ll look into that aspect later but for now, let’s get into the details of the bike. It has been customised by Vardenchi Motorcycles, who have in past have done a number of unique Royal Enfield mod jobs. They are based out of Pune and have also modified bikes for celebrities like Jackie Shroff and Akshay Kumar. The bike here is powered by Royal Enfield’s 350 cc engine and gets disc brake on both ends. The drivetrain is a mix of belt and chain drive. The front end gets unique headlight housing along with blacked out wheels and high raised cruiser styled handlebars. the indicators are built in the bar end itself. The saddle is again a custom unit with comfortable low seating for the rider. It has been finished in white with black detailing all over. The frame of the bike has been extended so as to give the bike a long, low slung cruiser look. As seen in the video, the rider can be heard exclaiming how unique and different this bike feels to ride. With its elongated frame and a huge rear tire, manoeuvrability for sure has taken a hit but the visual appeal compensates for all that. People can be seen stopping in their tracks to watch this mod Royal Enfield on the road. The question, however, is whether spending around Rs. 13 lakhs on a Royal Enfield is feasible or not. Well, this mainly depends on how deep one’s pockets are. If you have a couple of lakhs lying spare around, you can go for such exotic modifications which will stand out on the street. If not, then you can probably either go for a more affordable mod job. Another option can be to directly but a Harley Davidson or other such bike in such price. The choice, however, comes down to you in the end. « Meet the rally-spec Bajaj Dominar: Desert Storm ready!